Cages. Humans are the only beings that put other living creatures in them. Alfred Hitchcock in his youth was truant from school once, and was placed in a jail cell for a period of time by a policeman who wanted to teach him a lesson. It certainly did. Hitchcock has used the theme of the threat of incarceration in several films. Confinement symbolizes how we selfishly wish to control the world, sometimes at the world’s expense. Hitchcock's The Birds starts in a pet store, where all types of animals are in cages. Mitch (Rod Taylor) is looking for love birds for his young sister (Veronica Cartwright). Melanie (Tippi Hedrin) wants a mynah bird. Melanie is supposedly mistaken by Mitch for the sales lady, but he realizes she is the daughter of a big time newspaper publisher. She has led a rather reckless life, consorting with people who like to party. He mentions how she lives in a "gilded cage." It is difficult even for her to escape confinement, although hers is an affluent cell. He is a lawyer and admits to wanting to put people in jail. The theme of the human desire for confinement has been immediately established. Melanie wears a fur coat (animal cruelty?) and invades Mitch's privacy by using sources to find out where he lives (Bodega Bay). When she gets there, the man who helps her rent a boat to surprise the sister with love birds looks like he works behind a cage-like structure. Melanie is a predator, a bird of prey perhaps, hunting Mitch down, possibly wanting to cage him for herself. She invades his "nest" – his hometown and his family, which includes Mitch's mother played by Jessica Tandy. Melanie drives recklessly, too. She does not care about the harm she may inflict, but only wants self-gratification. When Mitch's ex-girlfriend, Annie (Suzanne Pleshette), asks who is knocking at her door, Melanie’s self-centered answer is "Me." She is sexually aggressive even in front of the ex-girlfriend, lies to Mitch about previously knowing Annie, and pushes Annie into letting her stay at her house. A bird slams into the door, as if to punctuate Melanie's self-involved audacity. At least in the beginning of the film she is representative of the selfish aspect of humanity that doesn't consider the disastrous repercussions of that self-centeredness. Melanie's actions seem to set off the subsequent bird attacks. The ones involving children are especially chilling. First, there is one at the sister's birthday party. Then, there is an assault at the school, a place of innocence, where the students are singing a sweet, sing-song tune as the crows gather on the monkey bars where the children would normally play at recess. The placement of this attack is, thus, ironic. The school is a place where we should learn, but it emphasizes that we have not learned how to respect the world around us, and nature in particular, as we satisfy our wants. As the birds continue their attacks, it is the people who are now confined, hiding to protect themselves. Melanie and the children are cornered in a car. She is trapped in a claustrophobic phone booth as the birds ram into it. Townspeople and visitors huddle in the diner. When a woman confronts Melanie as the prime mover of these events, she stares right into the camera, basically accusing the audience of causing this horror, and calling us evil. In this scene, Hitchcock is indicting us all. Mitch's mother is afraid of losing him. She wants the nest protected since she has lost her former protector, her husband, whose picture looms on the wall of the house, reminding her of the lost patriarch. 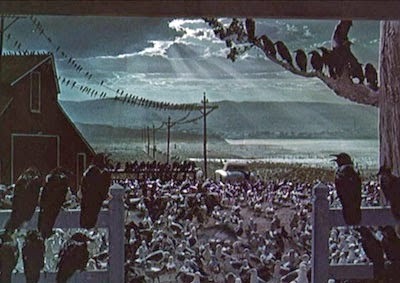 In the last attack of the film, the main characters are huddled inside their house, again emphasizing the cage motif. While the rest sleep, Melanie goes to an upstairs bedroom to investigate sounds. The birds have broken into the house, and now attack Melanie. She, the one who has disrupted the harmony of society and nature, is punished by the formerly abused creatures who are now the ones who break through the house's defenses, showing the humans what it is like when the rules of respectful existence are broken. 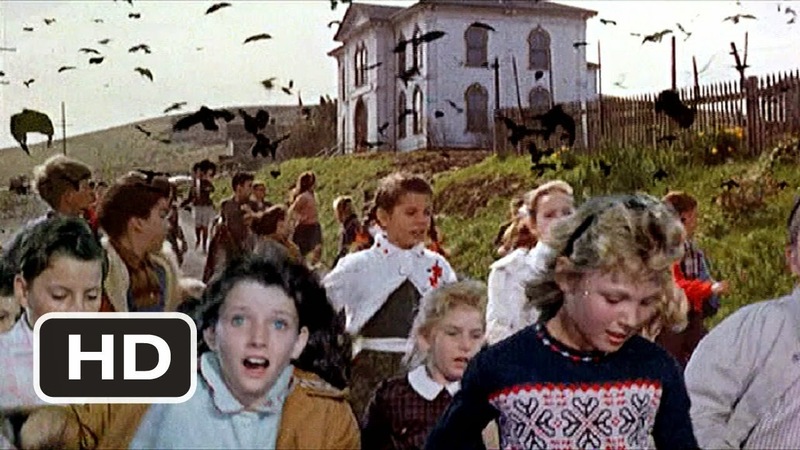 In the shot where the camera pulls back and looks down at the burning gas station, and the birds come into view as they fly down for an attack, it looks as if God is sending angels of death down as a punishment. The story is a bleak one. It is "the end of the world" as the scripture quoting character in the diner says. The only hope given us at the end as Mitch drives his family away from the house, is that Melanie, in her fragile state, is now part of the family, and the mother appears to be ready to resume her role as a nurturer, taking the young woman under her wing. But, they take the lovebirds with them, as pets still in a cage, implying that the humans have learned nothing. Next week’s movie is The Road to Perdition. Thanks for your comment. 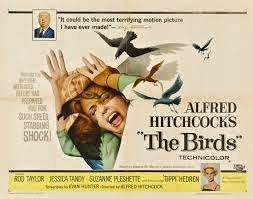 Hitchcock always has so much going on in his films. Besides the ones I already have analyzed, I'll be doing posts on "Psycho" and "Rear Window" in the future.